Front Row: Sailor, Jet, Echo, Topaz(Maddie), Pearl(Portia). Back Row: Jade(Luna), Ivory and Lace(Karma). Echo(Daddy) enjoyed the much deserved attention her received. Nothing like kids and dogs playing together. Maddie and Karma take a break from the action. Sailor's Olympic Dream Team were the objects of everyone's affections. Sydney enjoyed lots of affection. Ivory watches the activity from above. Claire enjoys her new puppy Beijing. London wears his Wheatley Waterdog scarf....how cute! Oslo falls soundy asleep after all the excitement. 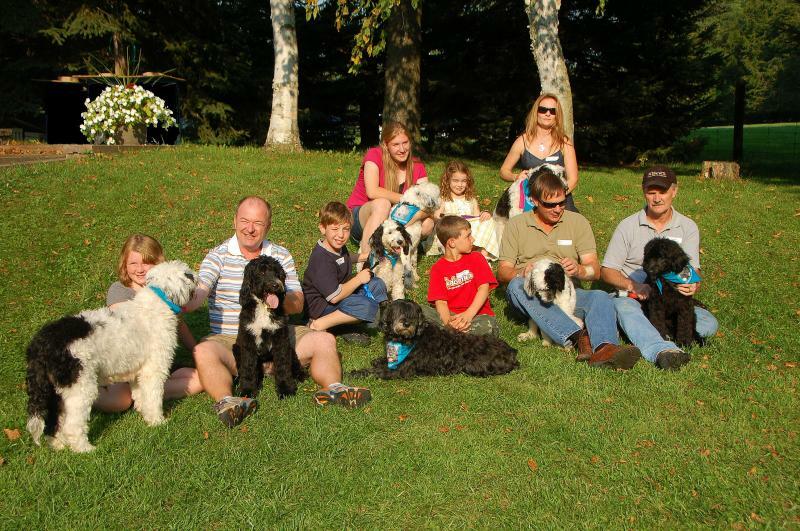 Thank you to everyone who came to our first Puppy Party to reunite Sailor's puppies.